The Tektronix 067-0916-00 is a video amplitude calibration fixture plug-in for the TM500 system. 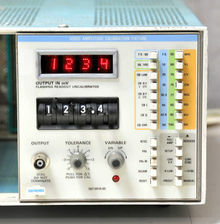 It measures waveform characteristics of video signals. The 067-0916-00 came with a Subcarrier Harmonic Rejection Filter (015-0407-00), 0.6% attenuator (011-0134-00), and precision terminator (011-0102-01). This page was last edited on 22 January 2019, at 10:56.